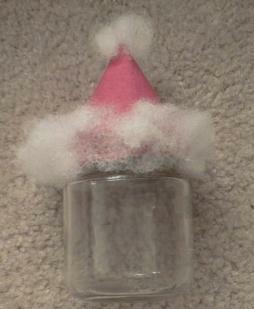 This Santa Claus baby food jar craft is fun to make and has practical uses (as a candy or coin holder). Cut a circle out of red construction paper about twice the size of the baby food jar (it doesn't need to be exact). 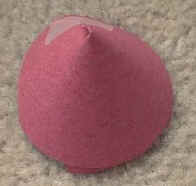 Overlap the edges of the slit to form a cone. Hold the cone over the baby food jar and adjust it until it just fits over the lid. Put a small amount of tape or glue to hold (we found tape easier). Take cotton balls (or cotton stuffing for pillows) and stretch the cotton out to make a long strip. Glue the strip to the bottom of the cone. 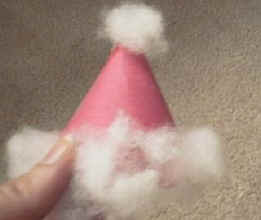 Glue a small cotton ball circle to the top of the cone. Loosen the lid of the baby food jar, but don't remove it. Put glue on the lid of the baby food jar. Set the cone on top. Press lightly to set in the glue. Put glue on the jar in a U-shape. Put cotton onto the U-shape (beard and hair. 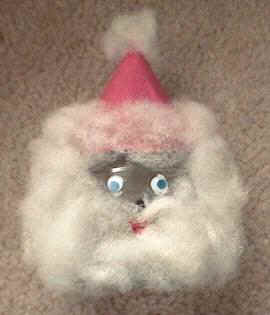 Cut a little construction paper nose and mouth (the nose can either be red or black) and glue onto the jar. Glue on wiggly eyes (or make paper eyes with white paper and a marker).